NewsTrolls ~ Currents: "A world thrown into turmoil by drought, floods, typhoons. Whole countries rendered uninhabitable. The political capital of the Netherlands submerged. The borders of the US and Australia patrolled by armies firing into waves of starving boat people desperate to find a new home. Fishing boats armed with cannon to drive off competitors. Demands for access to water and farmland backed up with nuclear weapons. Sound like the ravings of doom-saying environmental extremists? It's actually from a report commissioned by the Pentagon on how to ready America for the coming climate Armageddon. Submitted on August 31, 2005 1:21 p.m. by Eric~LaManque. [UserTrolls]"
"BAGHDAD, Iraq -- About 650 people were killed in a stampede on a bridge Wednesday when panic engulfed a massive Shiite religious procession amid rumors that a suicide bomber was about to attack, officials and a survivor said. It was the single biggest loss of life in Iraq since the March 2003 invasion." 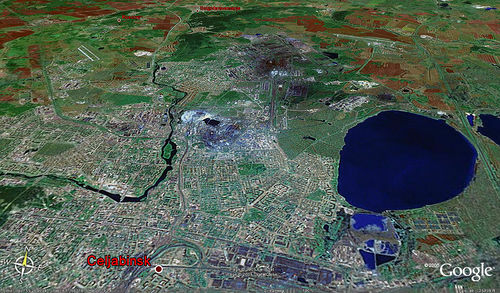 Sprol.com » Chelyabinsk, Russia: Not many people outside of Russia have heard of Chelyabinsk. And that’s just fine with the Russian government. They’ve been trying to hide this region of 3.6 million from world scrutiny for over 50 years. Consequently, from 1948-1951 contaminated waste from Mayak was directly dumped into the nearby Techa River which feeds into the Ob River, Russia�s fourth longest, and ultimately the Arctic Ocean. In order to maintain nuclear secrecy the residents from the 24 villages along the Techa were not warned even though they were exposed to radiation levels 20 times higher than at Chernobyl. "This storm is so large ... that it's like all the storms from last year rolled together and probably [those were] still not as bad," says Margaret O'Brien-Molina, spokeswoman for the American Red Cross in its southwest region. Coffee provides more than just a morning jolt; that steaming cup of java is also the number one source of antioxidants in the U.S. diet, according to a new study by researchers at the University of Scranton (Pa.). Their study was described today at the 230th national meeting of the American Chemical Society, the world's largest scientific society. VX, which the Army began producing in 1961, was designed for launch on rockets or to drop on large numbers of troops. It works like a pesticide; as little as a pinhead inhaled or touching skin can kill a person in minutes. 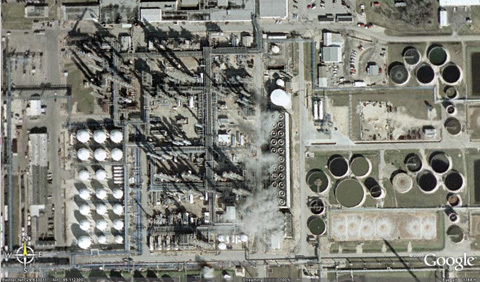 The chemical weapon never was used, and the nation's entire VX stockpile is housed at the Indiana depot. The goal was to have all of the material disposed of by the end of 2007, but delays have made the earliest possible date late 2008. Neutralizing the material--or watering it down to what scientists say is a caustic but not toxic solution--is the current plan, but that, too, has run into problems. The Centers for Disease Control and Prevention said in a recent report that diluting the agent may not be harmful to humans but might damage aquatic organisms. The Army suspended disposal operations in mid-June after officials at the facility discovered a wastewater leak during the neutralization process. 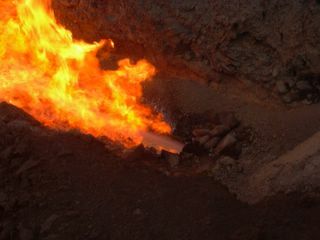 Inspectors also learned that the wastewater--the byproduct of neutralizing the material--was more flammable than expected. Utah Youth Treated Like Terrorists! This was one of the scariest things I have ever witnessed in person. I can't even begin to describe how surreal it was. Helicopters, assault rifles, tear gas, camouflage -wearing soldiers.... why? Was that really necessary? "$7 a gallon? That's what drivers in Amsterdam pay. But Europeans have long adapted to high prices." "LONDON (Reuters) Media rights groups demanded on Thursday that U.S. forces immediately release a Reuters journalist held in Abu Ghraib prison in Iraq unless they could explain why he is being held without charge. :Reporters Without Borders, a Paris-based organisation that campaigns to protect journalists detained or threatened because of their work, said it had written to top U.S. Middle East commander General John Abizaid to demand the release of 36-year-old Ali Omar Abrahem al-Mashhadani. It also accused U.S. forces of carrying out summary arrests of journalists in Iraq without providing any justification. " NEW YORK The American Legion, which has 2.7 million members, has declared war on antiwar protestors, and the media could be next. Speaking at its national convention in Honolulu, the group's national commander called for an end to all “public protests” and “media events” against the war. The Rev. Pat Robertson apologized yesterday for calling for the assassination of Venezuelan President Hugo Chavez, saying he spoke "in frustration" over the U.S. government's inaction toward a man who has "found common cause with terrorists." The religious broadcaster's comments Monday on his television show "The 700 Club" unleashed a flood of criticism, not only from the State Department and Venezuela's ambassador but also from some evangelical Christian leaders in the United States. Richard Cizik, vice-president for governmental affairs for the National Association of Evangelicals, discusses the backlash against conservative broadcaster Pat Robertson's comments calling for the removal of Venezuelan President Hugo Chavez. Robertson, 75, at first responded by insisting that his remarks had been misinterpreted by the news media. All hail the Flying Spaghetti Monster. What to do about religious radicalism? From Texas to Tehran, it's everywhere. Why not just invent your own religion? Or, easier for the less creative among us, join one that someone else has already concocted. Invisible Pink Unicorn anyone? Let's review. We have radical Catholics preaching against the use of condoms in Africa, radical Jews fighting for their right to remain in illegally occupied territory in the West Bank, radical Muslims blowing themselves up in cities across the globe, and a radical born-again Christian (Pat Robertson to be precise) calling for the United States to assassinate a world leader. Is it any wonder that many are not terribly drawn to any of the world's leading faiths? 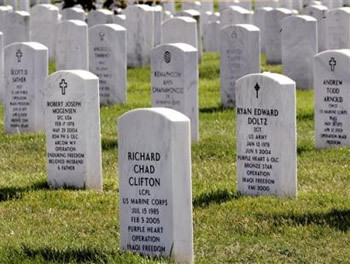 ARLINGTON, Virginia - Unlike earlier wars, nearly all Arlington National Cemetery gravestones for troops killed in Iraq or Afghanistan are inscribed with the slogan-like operation names the Pentagon selected to promote public support for the conflicts. The gravestones of fallen Americans buried at Arlington National Cemetery during the Iraq war era show a change in style from earlier conflicts, in Arlington, Va., Friday, July 1, 2005. Unlike earlier wars, nearly all Arlington National Cemetery gravestones for troops killed in Iraq or Afghanistan are inscribed with the operation names, such as 'Operation Iraqi Freedom' and 'Operation Enduring Freedom', which the Pentagon selected to promote public support for the conflicts. Partygoers at a rave in Spanish Fork Canyon that was busted by police Saturday night say officers used brutal and excessive force to clear the crowd. As many as 90 police officers from several agencies, including SWAT members and major crimes investigators, stormed the DJ-driven dance party around 11:30 p.m. dressed in full SWAT gear and holding automatic weapons. A helicopter announced the police presence as it crested a nearby hill and began shining a spotlight on the outdoor dance area, said 19-year-old Scott Benton of Logan. "The cops just came in wearing full Army [camouflage]. It was basically brute force," Benton said. "I had a gun put in my face and was told to get out of there." Standing in a crowd of people near the main stage, Alisha Matagi says she was just in the wrong place at the wrong time when she was thrown to the ground, punched, kicked and handcuffed by police. "I did absolutely nothing wrong," she said. Matagi was arrested with about 60 other partyers. She was booked into the Utah County Jail on the suspicion of resisting arrest and failing to obey an officer, according to police records. The title of this article is what the notice read on the morning of May 4, 1970 – it sat largely unread in the mail boxes of Kent State University students. Later that day, four students were murdered when the Ohio National Guard opened fire on a hillside filled with students – some protesting, some watching, others merely changing classes. Whether or not you are old enough to remember the tragedy at Kent State, please pay attention to this history. As we head into the age of aggressive protests, the police response is becoming more violent, such as in Saturday's actions in Pittsburgh, Pennsylvania and Salt Lake City, Utah. In Pittsburgh, protestors marched the wrong way up a one-way street to close down an army recruiting office. Police used both tear gas and tasers to subdue the protestors, and one 68-year-old woman was even bitten by a police dog – she was also arrested. In Salt Lake City, a crowd of 1,500 was tear gassed from helicopters. WASHINGTON (AP) - Asking for increased vigilance in the wake of the London bombings, the government is warning that terrorists may pose as vagrants to conduct surveillance of buildings and mass transit stations to plot future attacks. "In light of the recent bombings in London, it is crucial that police, fire and emergency medical personnel take notice of their surroundings, and be aware of 'vagrants' who seem out of place or unfamiliar," said the message, distributed via e-mail to some federal employees in Washington by the U.S. Attorney's office. It’s a fitting image for the U.S. prison system overall. In 1969, there were 150,000 individuals incarcerated. By 2001, that number had mushroomed to 2.1 million. That’s 7 out of every 1,000 U.S. residents, a higher rate of incarceration than any other nation in the world, a ignoble distinction previously held by Russia. Salt Lake City — A Utah television station is refusing to air an anti-war ad featuring Cindy Sheehan, whose son's death in Iraq prompted a vigil outside U.S. President George W. Bush's Texas ranch. The ad began airing on other area stations Saturday, two days before Mr. Bush was scheduled to speak in Salt Lake City to the national convention of the Veterans of Foreign Wars. In the ad, Ms. Sheehan pleads with Mr. Bush for a meeting and accuses him of lying to the American people about Iraq's development of weapons of mass destruction and its connection to al-Qaeda. "The U.S. Congress has decided to fund broadcasts into Venezuela, similar to efforts in the Arab World, to 'neutralize' Telesur's 'anti-American and anti-freedom rhetoric.' Venezuela's President, for his part, has promised to wage a 'merciless electronic war against the United States.'" Climate change melts away Canada's last big mass: "WARD HUNT ISLAND, Nunavut -- Three years after a huge crack split one of Canada's last remaining ice shelves in half, scientists have found fresh evidence that global warming is splintering the mass of ice. The Ward Hunt Ice Shelf is a cold and foreboding place at the edge of the earth, about 3,500 kilometres north of Edmonton. But its edges are quickly being erased as climate change rapidly alters Ellesmere Island, Canada's northernmost landmass. The ice shelf is a 450-square-kilometre ledge that's 25 metres thick and reaches up into the Arctic Ocean from the mouth of Ellesmere Island's Disraeli Fiord. It surrounds Ward Hunt Island, which at 83 degrees north lies at the very tip of land in the Americas." Environment ministers from 22 countries meeting in Greenland to discuss the devastating effects of global warming called for immediate action to stop climate change as the four-day meeting wrapped up. The political tide may be turning for Congress to curb greenhouse gases, Sen. Hillary Rodham Clinton said Friday at the end of what she called a "heartbreaking" tour of the Alaskan wilderness. project censored: "Civilian populations in Afghanistan and Iraq and occupying troops have been contaminated with astounding levels of radioactive depleted and non-depleted uranium as a result of post-9/11 United States’ use of tons of uranium munitions. Researchers say surrounding countries are bound to feel the effects as well. In 2003 scientists from the Uranium Medical Research Center (UMRC) studied urine samples of Afghan civilians and found that 100% of the samples taken had levels of non-depleted uranium (NDU) 400% to 2000% higher than normal levels. The UMRC research team studied six sites, two in Kabul and others in the Jalalabad area. The civilians were tested four months after the attacks in Afghanistan by the United States and its allies." Kirpotin describes an 'ecological landslide that is probably irreversible and is undoubtedly connected to climatic warming'. He says that the entire western Siberian sub-Arctic region has begun to melt, and this 'has all happened in the last three or four years'." The Great Lakes of the US, the planet's largest concentration of fresh water, is thawing earlier each spring, according to an analysis of ice break-ups dating back to 1846. ANCHORAGE, Alaska --Anyone doubting the effects of human activity on global climate change should talk to the people it affects in Alaska and the Yukon, U.S. Sen. John McCain said Wednesday." NewsTrolls ~ Why Cindy Sheehan is Right!
" In truth, Cindy Sheehan is absolutely right. Her son signed up in the military to defend America, not Israel, and to safeguard our own democracy, not the democracy of some foreign nation that neither wants nor needs it. : In advancing this war for Israel, government and media advocates obviously couldn’t get Americans behind the war by saying it was a war for Israel. They had to make up bogus reasons for the war, such as saying that Iraq was an imminent threat to America and that Saddam had weapons of mass destruction. Now that these lies have been exposed, they have changed the rationale for the war to “fighting for democracy” and “fighting against terrorism.” Here’s a short list showing why Cindy Sheehan is right! Submitted on August 18, 2005 9:03 a.m. by anymouse." "There has never been an empire more brutal, more cruel, more cynical, more savage, more hypocritical, and more dangerous than the one led by his counterpart, George Bush." Nearly 2,200 firefighters were battling dozens of wildfires in parched Portugal on Tuesday, :including 10 major blazes which were raging out of control and forced the evacuation of several mountain villages, officials said. The fire crews were backed by nearly 600 vehicles, 29 water-dropping aircraft and 176 soldiers as they tackled fires that have hit the centre and north of the country since Friday amid scorching temperatures, the civil protection agency said. Emergency services workers were evacuating residents from villages in the path of the largest fire near the central town of Pampilhosa da Serra which has been burning since Saturday, a spokesman for the mayor's office in the town said. 'The fire is completely uncontrollable,' Jorge Custodio told Lisbon-based Radio Renascenca." For the second summer in a row, the glacier state has been baking under sweltering skies, stirring anxieties about global warming and its impact on the polar region. August is meant to be a scorcher in Dallas but not in Fairbanks, where temperaturesyesterday were in the mid-80s Fahrenheit (high 20s Celsius). The weather has been clear and hot over almost all of Alaska for the past week, due to an intense high pressure dome that is reluctant to move on. Sprol.com » Alliant Technologies in Edina, Minnesota: "When you read “dirty bomb,” you probably think of terrorists - Jose’ Padilla, Adnan el Shukrijumah, Osama bin Laden. But the premier producer of “dirty weaponry” – weapons containing radioactive material – isn’t in Pakistan, or North Korea, or anywhere other than the pretty, mild-mannered, Midwestern town of Edina, Minnesota. A company called Alliant Technologies is at home amid the golf courses and subdivisions. Alliant Technologies makes its living by being one of the largest private contractors for the U.S. Department of Defense. Among its many products, Alliant appears to be the only U.S. provider of weapons loaded with “depleted” uranium, or DU. "The demise of Larsen-B was most likely caused by long-term thinning underneath the ice shelf as well as short-term surface melting due to global warming. The surface-melting rate has drastically increased over the last few decades." Scientist reaches for the sky to curb global warming - Sunday Times - Times Online: "FOR centuries man has dreamed of controlling the weather, from the rain dances of Native Americans to the fanciful exploits of Superman and other comic book heroes. Now Professor Stephen Salter, emeritus professor of Engineering Design at Edinburgh University, believes he can manufacture clouds that could help save the planet from global warming. Salter, who invented one of the first devices to turn wave power into electricity, claims that the highly reflective clouds could be used to bounce more of the sun’s rays back into space — counteracting rising temperatures caused by a build-up of greenhouse gasses in the Earth’s atmosphere." Indonesian forestry officials were trying to put out the fires with buckets of water yesterday, even as Jakarta refused offers of help from neighbouring countries, claiming it could deal with the crisis itself. The onset of the acrid clouds drifting across Kuala Lumpur has been made more galling to Malaysians by the fact that many of the fires have been set deliberately by plantation owners, farmers and miners on Sumatra to clear the land of unwanted trees - a practice criticised by environmentalists. There was a brief respite for Kuala Lumpur and central Malaysia yesterday as the wind changed, carrying the choking smoke away. But meteorologists warned that the respite was unlikely to last. Many people were still wearing face masks in Kuala Lumpur yesterday, and asthma attacks are soaring. Air pollution remained severe enough to be considered a health risk in six areas of the city, and many schools remained closed. Washington, DC - Today the Federal Communications Commission (FCC) issued a release announcing its new rule expanding the reach of the Communications Assistance to Law Enforcement Act (CALEA). The ruling is a reinterpretation of the scope of CALEA and will force Internet broadband providers and certain Voice-over-IP (VoIP) providers to build backdoors into their networks that make it easier for law enforcement to wiretap them. The Electronic Frontier Foundation (EFF) has argued against this expansion of CALEA in several rounds of comments to the FCC on its proposed rule." "THE world's largest frozen peat bog is melting. : An area stretching for a million square kilometres across the permafrost of western Siberia is turning into a mass of shallow lakes as the ground melts, according to Russian researchers just back from the region. Kirpotin describes an 'ecological landslide that is probably irreversible and is undoubtedly connected to climatic warming'. He says that the entire western Siberian sub-Arctic region has begun to melt, and this 'has all happened in the last three or four years'. Western Siberia has warmed faster than almost anywhere else on the planet"
The Supplejack-1 well in PEP 38741 (Austral : 30%, operator) is now being prepared for casing over two test zones, which will be flow tested in the coming weeks. The well was drilled to an along hole TD of 2570m (8,432 feet), and encountered two potential pay zones near 1950m (6,400 feet) and 1350m (4,400 feet). Electric logs indicate that the lower zone might flow oil at a modest rate; while gas flow is likely from the upper zone. Initial testing of the lower zone will proceed to oil production if successful, or if not then testing of the upper zone will be conducted, with gas being linked to nearby pipeline or used for onsite electricity generation in the event of success." At £55 million, the price-tag may be a struggle, the food won't be that great, and the chances of picking up a suntan are zero. But you should come back with some unique holiday snaps and something to tell the neighbours. The destination? The far side of the Moon, a region that cannot be seen from Earth and has only ever been viewed by a handful of humans. As a member of Deep Space Expedition Alpha, you will become a lunar pioneer, travelling nearly 250,000 miles into the void to orbit the Moon more than three decades after man last set foot there." "Brightly lit particles will zip through the atmosphere during the annual Perseid meteor showers this week. :In North America, the celestial firework display is expected to peak late Thursday night or early Friday morning. The Perseid shower occurs when gravel-sized debris from the comet Swift-Tuttle pass through Earth's atmosphere at more than 200,000 kilometres per hour and then burns up. The heated air lights up a long trail – the 'shooting star.'" HOUSTON – "With alternative energy sources decades from supplying US needs, motorists fretting over the cost of their next fill-up are left to wonder if America will ever wean itself from foreign oil." "The long-awaited energy bill was supposed to do much to push up domestic oil and gas production, but as President Bush signs the legislation Monday in New Mexico, it would appear that a dramatic boost in new US fossil-fuel supplies is unlikely." "One reason is that domestic drilling is already proceeding at a rapid clip, spurred on by a market in which oil is selling for more than $60 a barrel. Another is that much of what's known to be in the ground is running out or hard to reach. As for what's not known, the energy bill did not open up a lot of new territory to exploration. " Citing economics, climate change, and the projected growth in global energy demand, a US Department of Energy (DOE) task force cochaired by former Nuclear Regulatory Commission (NRC) chairman Richard Meserve and former New Hampshire Governor John H. Sununu has recommended that the federal government help revitalize the US nuclear power industry ..."
Air Force Chief of Staff Gen. John Jumper says he cannot confirm the impact on the upcoming Fiscal 2007 budget, which goes to Congress in February, but it 'is enough to be worried about.' Because USAF operates the bulk of the Defence Dept. 's gas-guzzling aircraft, it generally consumes the largest amount of fuel. Meanwhile, the service is cutting back by $3 billion this fiscal year. A slew of options to find funding for Fiscal 2007 and beyond are zipping through the Pentagon, including a significant retooling of the $245-billion Joint Strike Fighter program that would radically change USAF's buy and affect the plans of foreign partners. The Army and Marines supporting the Iraq occupation will also surely feel the effects." "A new study from the University of California shows, for the first time, that the deep-ocean circulation system of the north Atlantic, which controls ice-age cycles of cold and warm periods in the Northern Hemisphere, is integrally coupled to salinity levels in the Caribbean Sea. : This research reinforces concerns that global warming, by melting the glacial ice of Greenland, could quickly and profoundly change salinity and temperatures in the north Atlantic Ocean. One consequence might be much colder weather in northern Europe and Britain and perhaps even in eastern Canada and the U.S. northeast. 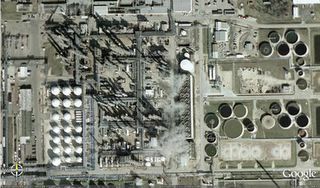 "What happens when you mix a small, Texas town near the Houston Shipping Channel with a conglomerate of over fifty chemical plants? 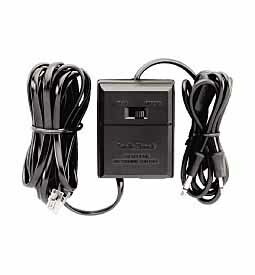 You get children born with birth defects and people with respiratory problems under virtual house arrest." "First it was the seabirds nesting too late and washing up dead on the beach. Then it was the fish, usually roiling in vast numbers, gone missing. Who Loves Creepy Megachurches? / Stadium crowds, thousands of rabid devotees, all chugging Jesus like Kool-Aid. Should you be afraid? Pastor Ted, that is, with his bright red hotline straight to the White House (he and our sanctimonious, war-happy prez speak at least once a week), Pastor Ted who, along with the snarlingly pious James Dobson of the violently militant Focus on the Family sect of frothy true believers, helped terrify the Federal Communications Commission and slam women's rights and galvanize all those mad throngs of confused Christians to vote to keep Dubya in office all these shockingly impeachment-free years. Praise Jesus." "Vancouver — Grizzly bears feasting on Pacific salmon provide iconic images of natural bounty that wildlife photographers have captured for generations. But a new study suggests something is wrong with this picture. The grizzly bears in British Columbia that feed heavily on salmon each fall are doing more than loading up on nutrients for hibernation. Research from the Department of Fisheries and Oceans and the University of Victoria shows that the annual feast of salmon is also loading the bears with pollutants -- including concentrations of chemicals that could affect the reproductive abilities of young females." 'My results suggest that future warming may lead to an upward trend in [hurricanes'] destructive potential, and - taking into account an increasing coastal population - a substantial increase in hurricane-related losses in the 21st century.'" By Noam Chomsky : "
08/02/05 'ICH' -- -- THIS month’s anniversary of the bombings of Hiroshima and Nagasaki prompts only the most sombre reflection and most fervent hope that the horror may never be repeated. In the subsequent 60 years, those bombings have haunted the world’s imagination but not so much as to curb the development and spread of infinitely more lethal weapons of mass destruction. A related concern, discussed in technical literature well before 9-11, is that nuclear weapons may sooner or later fall into the hands of terrorist groups. The recent explosions and casualties in London are yet another reminder of how the cycle of attack and response could escalate, unpredictably, even to a point horrifically worse than Hiroshima or Nagasaki. " Mr Vincent was abducted with his female Iraqi translator at gun point by men in a police car on Tuesday. His bullet-riddled body was found on the side of a highway south of the city a few hours later. He had been writing a book about the city, where insurgents have recently stepped up their attacks." The great desert has leaped over the Med. Is climate change to blame—or man and his works? USATODAY.com - Are our products our enemy? The harsh alkaline floor detergent caused the plastic in the cages to begin to disintegrate, which leached a chemical called bisphenol A into the animals' food and water. Suddenly, 40% of the eggs had chromosomal abnormalities. The question this posed for scientists: If plastic can do this to mice, what dangers do people face?" There are twenty-two nuclear power reactors in Canada - twenty in Ontario and one each in Quebec and New Brunswick. Below is a quick introduction to some of the concerns Greenpeace has about these reactors." Each of them either worked at the lab or was married to someone who was employed at the facility. There was talk of nuclear weapons experimentation, laser beams and top secret projects. That's what made the lab such an exciting place to work. And then there was talk of cancer, surgery and death. Those are the stories that matter now. Although the survivors' support group was a relatively small gathering, these people are just a part of a huge national story. The race to create and perfect nuclear weapons has taken, and continues to take, a terrible toll among the scientists, technicians and support personnel. Since 2000, nearly 100,000 work-related claims have been filed nationwide from nuclear weapons research sites."